Regenerative medicine is constantly developing. It is also the object of interest for scientists from the University of Warmia and Mazury. With their research, they want to help the terminally ill with amyotrophic lateral sclerosis. 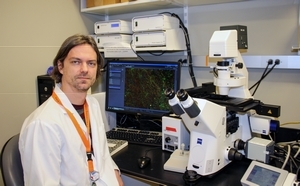 UWM professor Dr. Piotr Walczak is working on developing innovative therapies for amyotrophic lateral sclerosis (ALS). He is the director of the grant project "Application of glial progenitors for the treatment of amyotrophic lateral sclerosis." The cost of the three-year project is approx. 12 million PLN. The project involves six partners: the University of Warmia and Mazury, the UWM's public health care institution, the M. Mossakowski Institute of Experimental and Clinical Medicine of the Polish Academy of Sciences in Warsaw, the Institute of Human Genetics of the Polish Academy of Sciences in Poznań; Vetregen - a company providing services in the field of veterinary regenerative medicine, and a foreign partner - Johns Hopkins University in Baltimore, USA. "Amyotrophic lateral sclerosis, known by the acronyms SLA or ALS, is an incurable neurodegenerative disease that affects two persons per 100 000 each year. Most patients die within five years of the diagnosis," said Prof. Walczak. For many years scientists have conducted research aimed at determining the causes of this disease and to developing methods for its treatment. Unfortunately, there is no effective treatment for amyotrophic lateral sclerosis. In the course of ALS, a specific group of nerve cells degenerates - the motor neurons, which, as the name suggests, are responsible for controlling muscle movement. They allow us to move freely and, most importantly, breathe. A few years ago the results of groundbreaking research were published, presenting the theory that the degeneration of motor neurons is largely the result of abnormal functioning of brain helper cells. In addition to neurons, the brain includes helper cells - glial cells. These observations inspired Prof. Walczak’s team to conduct a series of tests. "Their aim is to provide an unambiguous answer to the question of whether the substitution of mutant glial cells by transplanting their healthy precursors able to transform into mature oligodendrocytes can lead to improving the functioning of the nervous system," said Prof. Walczak. The experiments began in January this year and are scheduled for three years. Preclinical studies have shown that in murine disease models the myelin glial progenitors demonstrate tremendous therapeutic potential. The results are impressive. "We are able to cure mice with genetic disorders of the oligodendrocyte function through transplantation of these cells. The transfer of these results to patients will require additional research. The big problem is still the control of transplant rejection," Prof. Walczak adds.